Time is a weird thing. 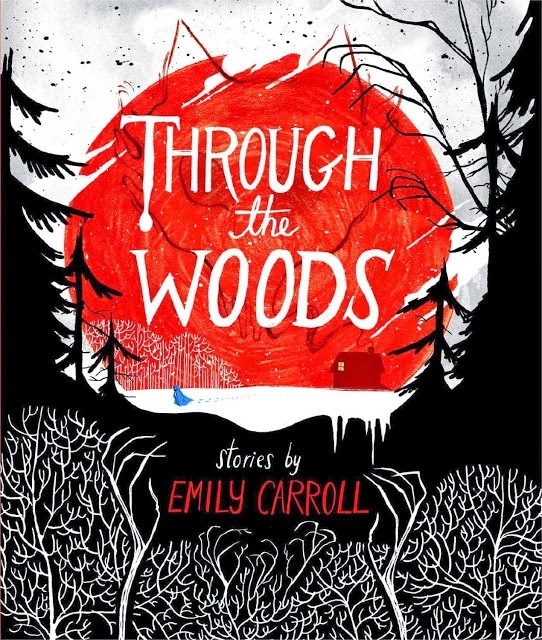 During the course of the research for this interview, for example, it transpired that Emily Carroll made her first comic in 2010, which is only just 4 years ago. It seems that Carroll has been on the scene for longer- simply due to her accomplishments- winning multiple awards for her online comics-, and the quality of her work, which has gained a reputation for excellence. 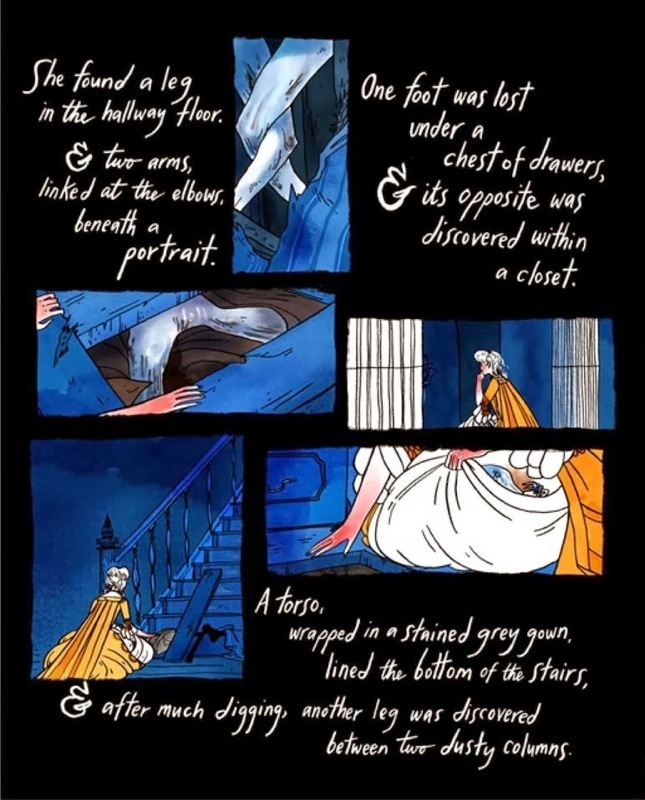 Her web-comics are set apart in that she prefers to release a story whole, rather than serialise it in installments, allowing easy access to anybody who comes across it, and also for her preference of the horror genre- again a lightly-trodden area in comic online. The combination of striking, beautiful imagery and narrative heft, showcased in fluid, organic (sometimes interactive) layouts tailored to suit the screen have gained her many a fan. But it's only been not-quite-four-years, and this week sees the release of her highly-anticipated first major book release, Through the Woods, a collection of six atmospheric horror stories, including the superb His Face All Red, and having read it, I can attest to both it's quality and the power Carroll's work carries on the printed page. If you were wondering whether it's worth picking up, I can reassure you on that front also: this is a book you want in your collection. 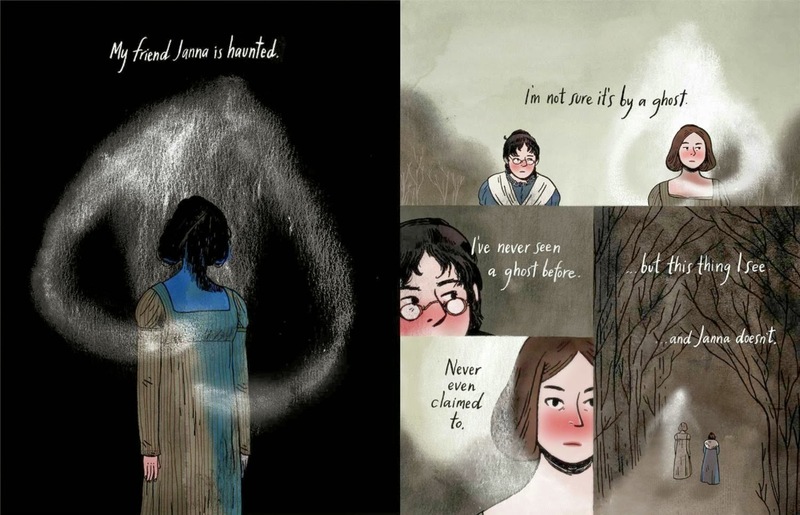 On the eve of the book's release, here's an interview with the artists herself, discussing favourite artists, the horror of children's books, starting out, differences in approach between print and online comics, careers, future projects, and more. One of the sort of 'mythic' things I associate you with is that you created your first comic in 2010 - I think it was His Face All Red- and were sort of instantly brilliant! What led to that decision or impulse to begin making comics when you did? It was a number of things! Before 2010, I’d wanted to make comics for awhile, because I’ve always had stories to tell, but I had never committed myself to drawing them, convinced that I didn’t know enough about comics, that I had to learn more before I started, that I would break some cardinal rule of comics-making and people would immediately see what an imposter I was. Just general insecurities like that. But ultimately there were a few reasons why I finally shoved all that aside and started. One was that I was already friends with quite a few people who were making comics or just generally creative -- people I’d met in college, like Vera Brosgol, Steve Wolfhard, Jon Klassen, just to name a few. So I had people around me making work I admired, proving that it could be done. I followed lots of artists on Livejournal and knew that there was a community out there for comics like the sort I’d want to make. Another reason was that in May of 2010 I went on vacation with the aforementioned Steve Wolfhard to a sort of podcast/comedy convention outside LA, called MaxFunCon. It’s a yearly convention with an emphasis on creativity, with making your thing, and just being there really inspired me to just try for once without worrying about looking bad or doing something wrong. 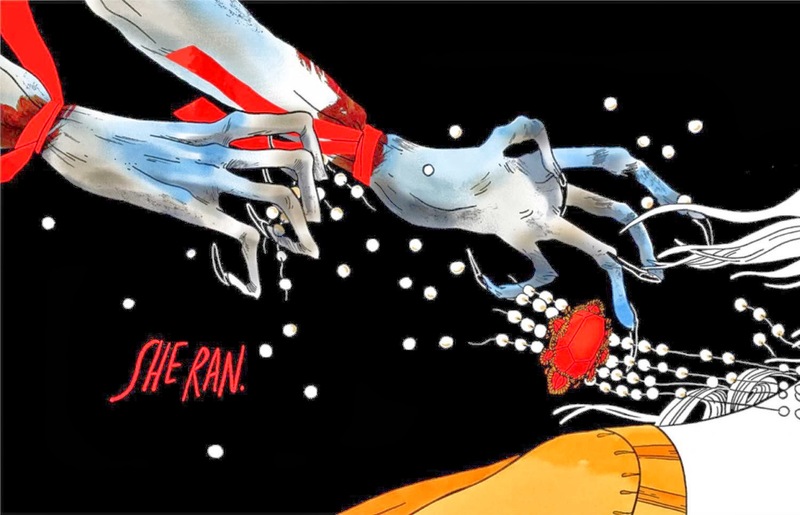 Two weeks after I came back from that convention, I’d finished my first web comic (called The Hare’s Bride). I posted it on Livejournal, and the positive reception I received from that really helped with my confidence, and so I made another comic, then another, and then Face All Red at Halloween, which received an overwhelming amount of attention. Did you always read comics, or was there a certain point at which you discovered them in a significant way? I always read them, in one way or another. I read Archie as a kid, and some Spiderman, some Batman, and every Catwoman story I could find (until I was eventually disillusioned with her at the ripe old age of eleven or so). It wasn’t until I discovered Rumiko Takahashi in highschool (particularly Ranma ½) that I thought I might actually like to tell stories via comics, as opposed to being a reader only. 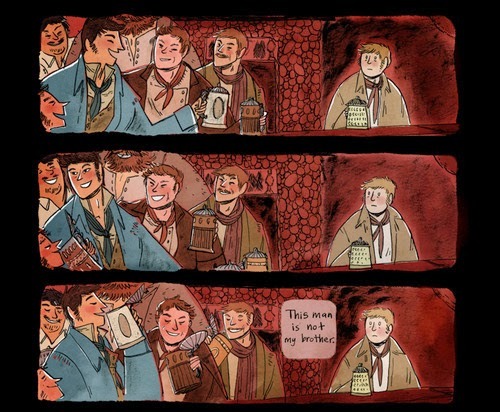 When I was thirteen or so I made nine pages of comic (it was a buddy/romantic comedy about a thieves guild), and I showed a couple friends who nodded politely, but that was about it. In retrospect I’m surprised I didn’t draw more actual comics, because I was constantly drawing and making up stories in my head for as long as I can remember (only some of them were about thieves’ guilds). What about the medium do you enjoy, or feel is special? I love that making a comic is like a storytelling puzzle. I like being able to come up with an idea and fuss with it, finding out what fits and what doesn’t, from both a narrative and a visual point of view. There’s a good measure of satisfaction for me when something hits in a way I wanted it to, even if it is worlds away from what I had originally envisioned (and it usually is). What kind of comics do you enjoy reading? Any favourite authors and books? Oh gosh, there’s a lot. I think if I could sprawl on a couch and summon any comic to me, I would go with something like Dungeon or Multiple Warheads (or maybe more Rumiko Takahashi). Most of the time I like fun comics with lots of worldbuilding -- I have to be in a certain state of mind to delve into anything too melancholy. All that said of course, I might also just go for Junji Ito, who is a huge influence on me and whose horror comics I adore. Actually, just writing that down made me think I’m going to go re-read some of his books after I’ve finished these questions (the Tomie series is a favourite). You've done comics in print before, although Through the Woods is your first major book. Do you approach comics you're making for print and comics for the web differently? Are there variations in what you have to consider, pacing, layout, etc? Definitely -- particularly with horror, where timing (and reveals) can really make or break a story. I feel like I have so much control over that sort of thing online, especially when you factor in things like mouse roll-overs, or gifs even, etc. I can stretch out as much as I need without worrying that I am wasting paper, for instance. And when I first started making comics they were all for the internet, simply because I didn’t have the time/money/inclination to deal with print shops and the like, and even if I did, I didn’t expect anyone would actually want a copy of whatever I made. The stakes were so much lower just posting online, and that took a lot of the pressure off of me. So I didn’t have a print/page mindset going in, not at first, I just drew whatever I needed to tell the story and arranged it however felt best. These days though I do take into consideration, at the writing stage, whether the comic is going to be for print or web. So many of my web based comics wouldn’t work at all offline, and my print ones are made especially for print (but could probably work on a screen just fine, to be honest). One of the things I love about the book is the fluidity of the layouts you've devised, and the way you make it look so easy! In the page above, for example, you have a vertical panel and 4 horizontal panels, all sort of floating in inky blackness, and they're not even really aligned (mimicking the 'searching high and low' that the lady is undertaking), but it works so well- a lot of open spaces and inserting panels within the page. People either go one way or the other with panels and grids, and it's refreshing to see an amalgamations and harmonious. In many instances it's for a deliberate effect, but is that composition an intuitive approach? Is it a way of really letting the reader in? I'd say most of the decisions I make when composing a new comic are intuitive, yes, from the writing to the layouts. The biggest reason for that style of layout in this book is that I wanted to evoke the look of a children's picture book more than just a horror comic, which is also the reason why I chose a page size that was a little wider than many conventional comics. 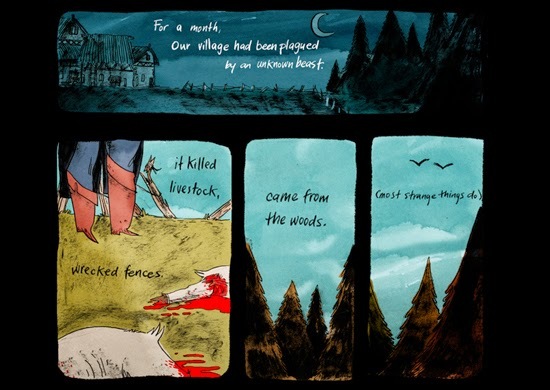 I also wanted it to look more like a children’s book than a horror comic because children’s books have terrified me ten thousand times more than any horror comic has. Which sort of relates to another part of it -- when I wrote and drew these stories, I hadn’t been making comics for very long. I don’t think it even once occurred to me to make something like a grid, I just placed information in the way I thought would have the most effect and clarity. The last story in the book uses panels in a more traditional way, and it was also the last comic I drew, and maybe reflects that I had started to experiment with that format a little more. Nowadays I have been having more fun with stricter grids and seeing what that can yield. This book was a lot of me learning how to make comics, something I’m still learning a lot about as I go. You've continued to create hugely successful web-comics (I guess this sort of noteworthy in that many artists produce print versions of their comics also, once they've garnered a following such as you have, but you've almost exclusively worked online in terms of comics until now)- what is about the platform that you like? What does it offer you as an artist? The biggest thing, for me, is (and was) that it’s immediate. Well, that and I don’t have to fuss about with printing costs or logistics -- I like the problem-solving inherent in storytelling and drawing, but I absolutely have no patience for the problem-solving involved in preparing things for print. The first time I made a mini comic I was so stressed out by setting up PDFs and folding and stapling and then paying for it all -- yeesh. And that was a black and white comic even, if I’d had to deal with the problems that arise with colour...I shudder to think about it. So anyway, web comics: it was low barrier to entry for me. And as I said before, the stakes were low, since I didn’t have to worry about (what seemed to me like) this fragile, physical process. I didn’t know how to deal with printing, but I know some basic HTML. I posted my comics on my livejournal at first, so I didn’t even have a site I had to maintain -- and now that I have a site, I can update a webcomic as I finish panels or scenes, seeing what it will look like and controlling it as it grows. And when it’s finished, and I’ve posted it, it reaches so many people so quickly. It’s so easy to share. These days, when I’m working on so much print work, I mostly think of webcomics as something to funnel nervous energy into. They’re an outlet. The most recent web comic I did, “The Hole the Fox Did Make”, is on my computer under a folder called “Calm Comics” because I would make a new strip of that story every time I was stressed out. I take my web comics as seriously as my print comics but there’s no schedule besides the one I set myself, no one I am obligated to, and my editor is my wife (who works in the same room as I do), so I do feel more free to try out new things and revise. Not really a question, but I was thinking audiences and reach and print and digital. And I wonder if you had gone the print route, and made all your comics as a mini-comics (instead of web-comics)- and they had been really successful, how that would measure against what you've achieved via the web. I'm not presenting this is as either or, but do you think that putting your work online, or creating new work online is perhaps a more viable option today for those starting out- is it tougher to start out in print? For me, yes, it would have been (see previous question where I seemed to have some kinda minor breakdown at the very memory of making my first mini comic). But it’s difficult to answer that, because I honestly just don’t know, it’s just not something I’ve had experience with. That said, I don’t think I personally would have had the same level of success if I had gone the strictly print route. The audience is much smaller if only because there’s a higher cost to entry (physically attending a show where I’d be tabling, buying my comic, etc). When people ask me about starting out in comics I do recommend trying a web comic, if they’ve the option -- or at least just getting their work online so that they might meet likeminded creators as well as readers. Mileage may vary. The conversation around web-comics is a strange, fractured one. I think most people still probably see them as inferior to print, and view them with suspicion, despite a wealth of good work being done there. Do you think there's still that legitimacy problem, and if so, why? I do, yeah, though I also feel a little absurd saying so because I have actually received what I consider a lot of “legitimate” attention (in terms of publishers, awards) for my web comics. I don’t think that’s usual though. Part of it might be that there’s this weird assumption that I feel a lot of (boring) people make when it comes to web comics -- that because there’s no gatekeeping, there’s no quality control, or that because this is work that is (usually) free, people don’t put the same effort into it that they would for print comics etc, etc... which is all nonsense, of course. That lack of gatekeeping is wonderful. For someone like me, who rarely saw anything which reflected the sorts of stories I wanted to tell (or honestly, anything with my drawing style) in comic shops growing up, print comics just felt like something that would never be an option. I suppose, for instance, I can understand the hesitancy of some sites to not want to review web comics because so frequently they are ongoing works, and their preference might be for only reviewing completed work -- but then again, I barely saw any mentions of The Less Than Epic Adventures of TJ & Amal ending after a run online of several years, and that’s basically one of the best comics going, online or otherwise. Ultimately, really, if someone is skeptical of web comics sheerly for the reason that they’re web comics, that’s their loss. I’ve read and seen such a wider variety of styles, stories, and (most importantly) creators online than I ever have seen in any comic shop, where sometimes it can seem like there’s just so much of the same. What is about horror that resonates with you? What makes it the ideal vehicle for your stories? I’ve always liked horror -- I’ve been watching horror movies since I was a really little kid (despite my mom’s objections, she is keen to remind me, it was all my dad and older brother’s influence). I’m such a nervous person in general, I feel like I am rattling with fears at all times, and horror is a way to let myself feel afraid without feeling controlled by it, to even laugh at my fear (depending on the movie/story) and contain it. It’s a(nother) anxiety outlet, basically. And in the case of my horror comics, so many of the characters I write about are so similar to how I perceive myself, just taken to an extreme -- they are angry and cowardly and roiling with envy -- and I can do horrible things to them, which is pretty cathartic. And that sounds terrible when written out, but it’s true! A lot of your work builds on the dark fairy-tale, folklore tradition. The stories have an element of familiarity whilst being fresh and new. Is it empowering to take these stories that generally featured women in peril, tragic women, women in need of saving, evil women, and give them greater complexity, beyond good, bad, etc? 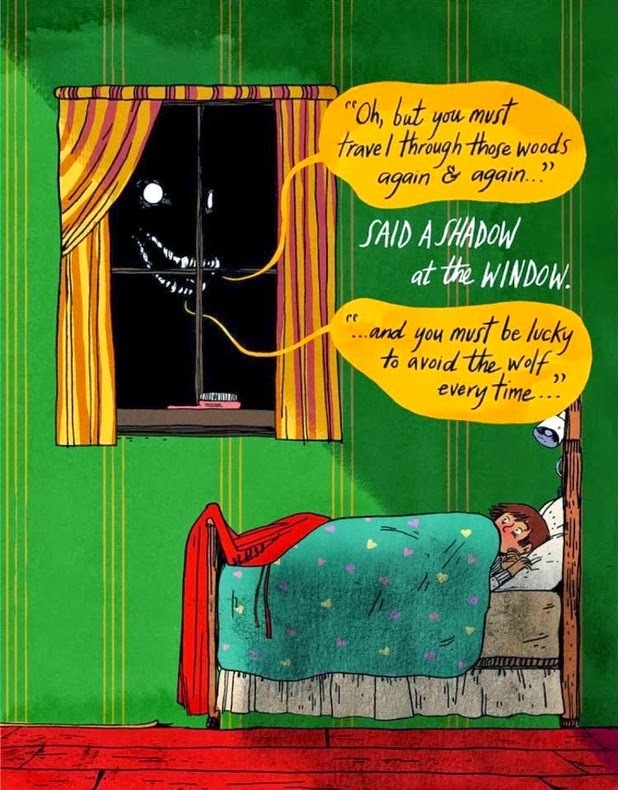 Or is there something particular about fairytales that appeals to you? Fairy tales appeal to me for a number of reasons. One is that I appreciate the communal quality of them, the regional variations, the liberties you can take when you retell them yourself -- the cadence and spoken word quality of fairy tales largely inspired the stories in Through the Woods, and in all my comics really, and what the words sound like aloud is something that I take into consideration as I write (and I test it out a lot, muttering as I go). Another reason is that the logic of fairy tales is not beholden to some sort of stringent three act structure or policy of payoff, it can be surprising and strange all the way through. What matters more than logic and a tightly told structure is emotion and imagination and ambiguity, things that I prefer personally. Oh, and I also like magic and the supernatural and strange morality mixed with witches and the like, so fairy tales suit me in all kinds of ways. There are so many fairy tales that involve clever and heroic women too, but they don’t get as much attention as the more damsel in distress type of stories unfortunately -- and honestly, what empowers me more than correcting the faults in fairy tales is adding a greater variety of characters in horror comics. Classic horror comics, the western ones I grew up reading, frequently position women as victims or monsters, punished or murdered by the story’s end. Horror is great because you get to explore a character’s fears and doubts and general humanity, and no one is supposed to be a stellar example of moral fibre. I’m a sucker for a tragedy, but I like to try and go for the complexity you mention, I find a stronger character is found in those grey areas. Oh, this is the rare instance in which I am unlike a Hollywood actor -- I do reread my comics once they’re out there, though I don’t usually change anything about them once they’re posted (in the case of web comics). It’s more like I do something to the best of my ability and then when it’s done with it’s done with, it will never be 100% fine but it’s done with. There are a number of stories that I would write and draw differently now, given some perspective on them and general evolution of my artistic sensibilities, but I’d rather move on to the next thing and try to make something better than endlessly fuss. Because I would endlessly fuss. Do you see yourself as an artist/ cartoonist for the long haul? You keep reading about how there's no money in comics, and the amount of amazing cartoonists who both work full-time and create when they can make time is very high. Are those aspects- stability, longevity, viability, ones you think about? I am definitely in it for the long haul, yes (I just knocked on wood). I would make more money if I went back to television animation, and I could do my comics on the side like I did before, but I am doing okay enough now to stick with it, and I have things lined up for the future which will hopefully support me (knocking on wood again -- wouldn’t it be a hideous irony if that’s how I permanently injured my drawing hand??). I still feel like I am very new to comics and I have a lot I want to do, so we’ll just hope this whole thing pans out. What's next-do you have anything upcoming that you can tell us about? A whole slew of things -- right now I am finishing up artwork for Baba Yaga’s Assistant, a YA graphic novel written by Marika McCoola, about a girl who runs away from home to be, well, the titular assistant (that will be published by Candlewick), and I’m simultaneously writing and drawing a 32 page horror comic for the Frontier series published by Youth in Decline, which will deal with children’s games and urban legends. That should be out in autumn. After those are finished I’ll be working on the graphic novel adaption of Laurie Halse Anderson’s novel Speak. In between all that though I hope to eke out some time to work more on web comics, and possible even games a little more. Currently watching: The last movie I watched was the 1976 Carrie, but mostly I’ve been marathoning Brooklyn 99 on Netflix. Sound: My wife outside, using a hedge trimmer on our horrible hedges. Closest thing to hand right now (not your computer! ): A LEGO wolf-faced-cowboy-schoolmarm my friend made for me. One food: The last thing I ate was bacon and eggs (and sausages, and toast, I’m so sleepy now). Could not live without: Time to myself, I think. Raising an eyebrow at: Right now, my cat, who thinks he can meow his way into getting extra food. Something beginning with 'g': Gorgon! Many, many thanks to Emily for taking the time to answer my questions.